Born in Blairgowrie Perthshire, he was largely self taught . Farquharson moved to Edinburgh 1872 and London in 1886 where he lived until 1894 after which he moved to Cornwall. 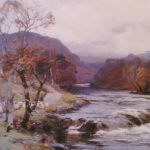 Farquharson painted the Scottish Highlands, moors and rivers and the lush lower pastures and the estuaries of Holland. In later life he also painted the English landscape.